How many hurricane seasons are there? For residents of Gulf coast states, Florida, eastern USA, the Caribbean etc. the annual Atlantic Hurricane Season is the only hurricane season. If you work for the National Hurricane Center in Miami, Florida you monitor two seasons every year, the Atlantic Hurricane season “officially” running from June 1 through November 30, and the Eastern Pacific season that starts on May 15 every year. What of those residents on islands in the center of the Pacific ocean? Are they affected by hurricanes generated in the Atlantic? No! What about hurricanes forming in the western Pacific, where they are called typhoons, ocean? No! But there is a so-called Central Pacific Hurricane Season. In fact there is another region where tropical cyclones can be generated, where they are called cyclones, over the northern Indian ocean where there is also a separate hurricane season. The reality is that there are roughly seven oceanic regions in the world where cyclogenesis, the generation of tropical cyclones, takes place and fuel seven distinct hurricane seasons annually. In this regard it is important to note that these cyclogenesis basins are not clearly defined regions in the geographical sense, but rather general areas where tropical cyclone generation occurs, which may also have sub-basins. For example we refer to the northern tropical Atlantic as a basin for cyclogenesis, but there are three or four sub-basins within it including the Gulf of Mexico, the Caribbean, “hurricane alley” near the Cape Verde islands, hurricane alley near the Lesser Antilles etc. A different way of looking at hurricane seasons on a worldwide basis is to think of tropical cyclone development that takes place in the northern hemisphere, and that which happens in the southern hemisphere. One of the first things we discover when comparing northern versus southern cyclogenesis is that annually, on a worldwide basis, there are approximately 80 to 85 tropical cyclones and of these roughly 70% are generated in the northern hemisphere. This points out the higher vulnerability of the northern half of Earth to tropical cyclone impacts, especially when the percentages of human population and landmass area are taken into account. 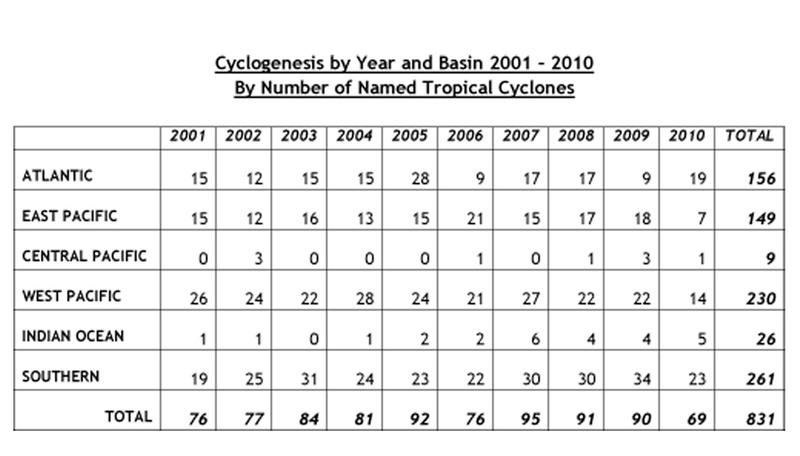 There are of course fluctuations in this northern cyclogenesis bias; for example in 2009 only 62.2% of the total number of tropical cyclones generated in the northern hemisphere, while in 2001 that percentage was 75.0%. How are we doing so far in 2011? As of 3 October 2011 there have been a total of 62 named tropical cyclones worldwide, which is close to the total in 2010 around the same time of the year. Should this trend continue, it would appear 2012 will be below average in terms of recent worldwide cyclogenesis, based on the ten year (2001 – 2010) average of 83.1 named tropical cyclones per year. 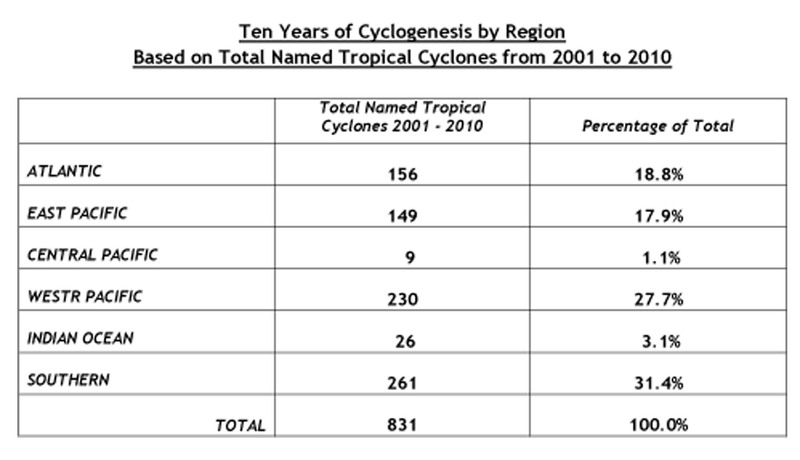 On a basin by basin count, as of 3 October 2011 there have been 16 named tropical cyclones in the Atlantic basin compared to the ten-year average of 15.6 named storms, but keep in mind 30% of the “official” Atlantic hurricane season remains ahead, so it is possible the total number of Atlantic named tropical cyclones could grow higher. In contrast, the Western Pacific basin has generated 19 named tropical cyclones so far in 2011, which is below the ten-year average of 23 named storms. The southern hemisphere, which includes four sub-basins, has generated 18 named-tropical cyclones in 2011 compared to its ten-year annual average of 26.1 named storms, however as the tilt of the Earth’s axis continues to take us toward the southern hemisphere’s summer there is a high probability that there will be quite a bit of cyclonic activity south of the equator during the remainder of 2011. So, what do these numbers tell us? By themselves these numbers, as abstract quantities, provide very little information. One conclusion to be drawn is that the 2011 Atlantic hurricane season, so far, has been above average, which is what was expected given the high activity era that has prevailed over the Atlantic since 1995 as a result of variations in the Atlantic multi-decadal oscillation. The other, is that on a worldwide basis cyclogenesis appears to be slowing down in 2011, just after having been at its lowest level in the last ten years in 2010. When be pair these numbers with qualitative data then they provide more meaningful information. For example if we look at the 2011 season in the Atlantic in terms of number of tropical cyclones, and we compare the 16 named storms so far this year with the 1981-2010 average of 12 named storms per year, we will conclude that this is an overactive, above average, season. However the long-term annual average shows 6 [actually 6.4] of the 12 named tropical cyclones reach hurricane strength every year in the Atlantic, but so far we have only had 4 marking this as a below average season so far at least. Regarding this topic of above or below normal seasons, the Climate Prediction Center [CPC] a division of NOAA’s National Weather Service measures total seasonal activity by combining the total number of named tropical cyclones, hurricanes, and major hurricanes with something called the Accumulated Cyclone Energy [ACE] index. The ACE index is a measure of wind energy, which is based on the maximum sustained surface wind speeds and the duration of all named tropical cyclones for the time they are at least of tropical storm strength. By using a mathematical formula based on the sum of the squares of the maximum sustained wind speeds in knots, measured at six hour intervals, CPC arrives at an index that is then compared to the median wind energy index for the 1981-2010 period to determine if the current season is above-normal, near-normal or below-normal. Based on the ACE index the 2011 Atlantic hurricane season so far is well below-normal. So which one is it? This is getting confusing! One the basis of what has transpired so far this year, is the 2011 Atlantic Hurricane Season above normal, below normal or just about average? Per our discussion above, it would appear the answer to this question depends on the measuring stick you use, and since three different criteria have been used: (a) total number of named tropical cyclones, (b) number of tropical cyclones reaching hurricane strength, and (c) the ACE index, three different answers were obtained and each one is correct. 1. Could it be that cyclogenesis, the generation of tropical cyclones, may be declining in response to external factors on a worldwide basis? With 2010 a below-average year for cyclogenesis, and 2011 following along the same lines, are we seeing a trend? 2. Are we witnessing a trade-off between fewer tropical cyclones in exchange for more extreme precipitation events driven by global warming? This line of questioning takes me back to 1998 and 1999 when I actively participated in the National Assessment of Global Climate Change Consequences in the USA [NA], and in the course of similar inquiries in various meetings and group discussions I submitted the following thesis: the threshold for cyclogenesis to occur may change in response to global warming, as the atmosphere can hold more moisture and the spatial range of warmer sea surface temperatures expands there may be changes in convection and in the atmospheric lapse rate, which may lead to changes in tropical cyclone generation and precipitation events. My thesis was based on the thinking that heat transport mechanisms in the coupled atmosphere-ocean would gradually change under the influence of global warming, and this would in turn affect atmospheric processes such as precipitation and cyclogenesis. Perhaps is time to go beyond the realm of empirical data or anecdotal evidence and submit my thesis to the rigor of scientific research. I would like to end this piece with the following thought: while it is important for planning purposes to characterize annual hurricane seasons on a basin-specific basis, and to understand what is happening in terms of cyclogenesis under the influence of global climate change, it is even more important for vulnerable communities to be able to characterize the potential impacts from hurricanes, to be prepared and to practice mitigation to reduce the potential for damage from such impacts. In the end it is all about the impact, and it may only take one impact to cause catastrophic damage and untold human suffering! A way of looking at this is as if these are two separate issues, one is about a field of research where many unanswered questions remain, and the other is about preparedness and mitigation in vulnerable communities. 4. Iribarne, J.V., Godson, W.L.,: Atmospheric Thermodynamics. 1981 2nd ed. Dordrecht, Netherlands.